Paxymer is the flame retardant system for polyolefin plastics. It is 100% halogen free and our solutions are delivered as a synergist and as a master batch for all polyolefins e.g. PP, PE, EVA, TPE, TPO. Paxymer is compatible with mineral and intumescent (P/N-systems). We can also formulate our functional polymers to meet your specific demands. 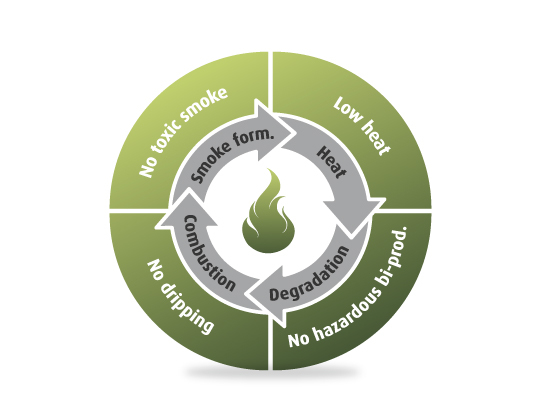 Paxymer ensures safe burning behavior. Paxymer retains base material mechanical and processing functionality. Paxymer meets current and future chemical and environmental legislation. Paxymer is designed for safe burning behavior. Our new, patented, flame retardant mechanism results in a unique burning process that saves lives in a fire situation. Paxymer is designed with functional polymers to address the three main problems encountered in burning polymers; heat release, smoke release and toxicity and flame spread through dripping. Paxymer FR-functionality: low heat release, stabilizing, non-dripping and low smoke toxicity. Low heat-release rate limits flame spread and increases the time to flashover. Paxymer reduces the heat release rate to <200 kW/m2, a 3-5 time reduction compared to a virgin olefin and 2-3 time reduction compared to brominated systems. Heat release rate is considered in burning standards for building and shipping such as EN-13501, EN-5660 and DIN 4102. Low smoke toxicity. Fire deaths are commonly caused by toxic smoke. Paxymer emits very low to no levels of CO and CO2, NOx, SOx and HCN. Paxymer is also free of corrosive gases such as HCl and HBr. Non-dripping behavior limits flame spread and re-ignition of other material in a fire situation. Paxymer’s unique crosslinking mechanism achieves non-dripping by using functional polymers. It is completely free of salts, flouropolymers and other conventional solutions. Paxymer achieves excellent mechanical performance through our unique multi-mechanistic system design. Good compatibility and dispersion in our master batches makes addition of Paxymer straight into the conversion (e.g. injection molding or extrusion) process possible without significant loss of mechanical properties. Examples in the following tables are from customer projects. These examples do not represent the limits of the product, rather they give an idea of what has been done in other projects. Selection of base polyolefin material and processing properties has a significant impact on mechanical properties. For more mechanical data, register and download our technical presentation. Paxymer is completely free of persistent, carcinogenic and endocrine disrupting chemicals. We participate in a number of programs and initiatives and our ambition is to apply the latest flame retardant technology for optimal functional and environmental performance of our formulations. Paxymer is a proud participant in the UNEP’s POPs-free project. Paxymer is represented in Subsport – The European Union’s Substitution Support Portal toward safer alternatives. Paxymer conducted an environmental assessment with the Jegrelius Institute for Applied Green Chemistry. Read the report here [PDF]. Paxymer is a proud member of Cleantech Inn Sweden. We are also certified according to Svensk Miljöbas (equiv. to ISO14000 for SMEs). Read our environmental policy here [PDF]. Paxymer has gained experience with a wide variety of applications and fire standards over the years. Our system is flexible and adaptable with versatile technical abilities. The following documentation gives examples of our products and product data from our customer evaluation projects. Register to download these documents in PDF. Please contact us for MSDS and TDS of relevant grades.